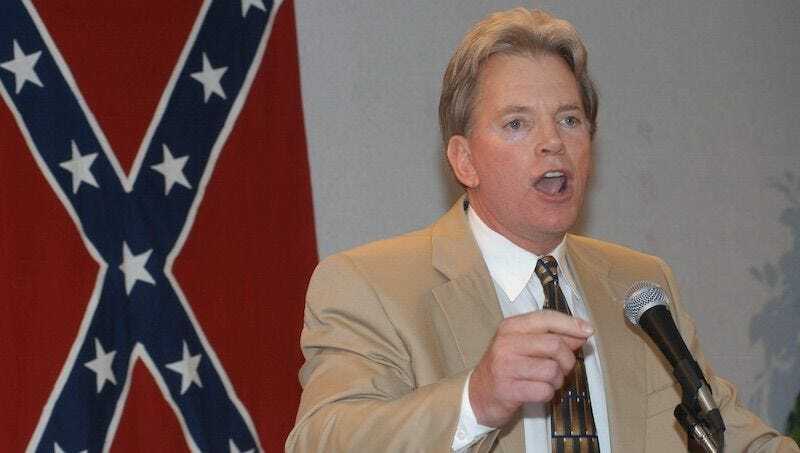 Former Ku Klux Klan grand wizard and struggling candidate for Senate David Duke has recorded a robocall encouraging Louisiana voters to support him and Donald Trump, BuzzFeed News reports, which the Trump campaign, defying all reasonable expectation, was quick to repudiate. A recent Hillary Clinton campaign advertisement excerpts an interview, conducted in April, with the Imperial Wizard of the Rebel Brigade Knights of the Ku Klux Klan, in Richmond, Virginia. “I think Donald Trump would be best for the job,” the Imperial Wizard told NBC12. “The reason a lot of Klan members like Donald Trump is because a lot of what he believes in, we believe in. We want our country to be safe.” The Imperial Wizard also said that the KKK is no longer a violent organization and is not a hate group. Trump has announced that he will make a speech directly addressing immigration, the signal issue of his campaign, in Arizona on Wednesday. Nazis and White Supremacists Love Donald Trump. You Know Who Else Nazis Loved?